To Cite: Hosseini N, Talezade S, Yassaie S, Moradi Z. Prevalence of Open Bite Malocclusion Among 11 - 12 Years Old School Children in Yazd, Iran, Iran J Ortho. 2015 ; 9(3):e4845. doi: 10.17795/ijo-3740. Background: Many studies have been conducted in Iran to know the prevalence of malocclusions and orthodontics needs but no study so far has been conducted in Yazd. Objectives: The aim of this study was to determine the prevalence of anterior open bite (AOBO) among 11 - 12 years old school-aging children in Yazd, Iran. Patients and Methods: A total number 550 (278 boys and 272 girls) school aging children between 11 - 12 years old with permanent dentition were selected in this study from Yazd, Iran. The subjects were randomly selected, and none had received previous orthodontic treatment. Clinical examinations were carried out by one trained and calibrated examiner. The occlusal anteriorposterior sagital relationship were assessed based on the angle classification and also the vertical anterior relationship. The statistical software SPSS version 22 was used for the analysis different parameters as gender and age. Results: AOB was present in 2.9% of subjects. 2.1% of the male and 3.6% of the females students in the sample were affected with anterior open bite. The prevalence of class I, class II and class III malocclusion with AOB was 1.7%, 3.2%, 21.4%, respectively. Conclusions: This study shows that 2.9% of children examined had anterior open bite malocclusion which required treatment. Anterior open bite is a vertical occlusal abnormally with actual vertical gap between the upper and lower incisors with the teeth in centric occlusion (1). Anterior open bite as defined by Ng et al. (1) and Kwon et al. (2) is the failing of upper incisors teeth crowns to overlap the incisal third of the lower incisor crown when the posterior teeth are brought into full occlusion. This was also, described as a vertical discrepancy. It is also described by the deviation in vertical relationship of maxillary and mandibular dental arches with definite lack of contact in vertical condition between opposing segments of teeth (3, 4). Nowadays anterior open bite is defined in two ways: first no vertical overlap of incisors and secondly no occlusion contacts which the absence of occlusion to antagonist teeth is more important (5). All children experience anterior open bite during the transition from primary to permanent dentition with little disruption in their oral physiology during this period, which can span 1 to 2 years. The Prevalence of anterior open bite varies from 3.1% (6) to 46.2% (7). The prevalence of dental open bites in US children is approximately 16% in the black population and 4% in white population (8), with the prevalence of simple anterior open bites (involving mainly the incisors) decreasing until adolescence (9). Thilander has described the prevalence of anterior open bite from 6.2% in late mixed dentition to 8.7% in permanent dentition (10). In our environment; there appear to be few studies on the prevalence of anterior open bite in early permanent dentition. The aim of this descriptive study was to determine the prevalence of anterior open bite (ABOB) among 11 - 12 years old school-aging children in Yazd, Iran. A sample of 573 (283 female and 290 male, 11 - 12 years old) with permanent dentition was randomly selected from population that attended the middle schools of Yazd, Iran. Sample size was determined by using the highest prevalence rate of 15% from a similar comparative study with a confidence level present at 95%. Children who had previously any kind of orthodontic treatment were excluded from the examination. Thus, children with cleft syndromes and systemic health disease, were not include in this study, as those treated in special hospitals the final sample was reduced to 550 subjects (272 females and 278 males). The questionnaires including the oral examination were pre-tested in a pilot study on 50 children under similar conditions to that used in this study. An intra-oral examination was carried out by one calibrated and trained investigator to determine the presence of anterior open bite and sagital malocclusion. Informed consent was obtained from both the school authorities and parents. The SPSS version 22 was used to analyze the data and chi-square and t-test applied were appropriate with P values (P < 0.05) regarded as significant. The sample population consisted of 550 subjects 272 girls (49.4%) and 278 boys (50.5%) aged 11 - 12 years. The prevalence of anterior open bite in the community was 2.9% (2.1% girls and 3.6% boys). Anterior open bite was shown in 1.7% with class I (289subjects), 3.2% with class II (247 subjects) and 21.4% with class III (14 subjects) malocclusion (Table 1). It is shown that there was no significant relation between the prevalence of anterior open bite to gender, age, and anterior posterior malocclusions, but there was a significant relation between gender and anterior posterior malocclusion (P = 0.0001) that include 72.3% of males and 32.3% of females had class I, 26.2% of males and 63.9% females had class II and 1.4% of males and 3.6% of females had class III malocclusion (Figure 1). The prevalence of anterior open bite in 11 - 12 years old children in this study is 2.9% which is almost similar to another study carried out by Jones et al. (11) in school children of 2.1% and 3.5% (12) but lower than Ng'ang'a et al. (13) study of 8%. Although many studies have been published that describe the prevalence of anterior open bite, it is difficult to compare and contrast these findings; in part because of the varying methodology, age differences of the study populations, examiner subjectivity, specific objectives, and the different sample size. Antanus Sidlauskas and Kristina Lopatein found anterior open bite in 3.46% of school children (14). In another study 8.2% of Central Anatolian adolescent having open bite were found by Gelgor et al. (15). This study shows the fact that anterior open bite will decrease with age; 3.5% in 11 years old to 2.8% in 12 years old children. Masticatory (16) and speech (17) problems have been attributed to open bites. Other patients indicate displeasure with their facial esthetics (18). Many open bites will resolve gradually without treatment, and transitional open bite, which make up for many of the samples, are of little consequence. Complex open bites, and those that do not resolve at the end of the mixed dentition years, can be more problematic. 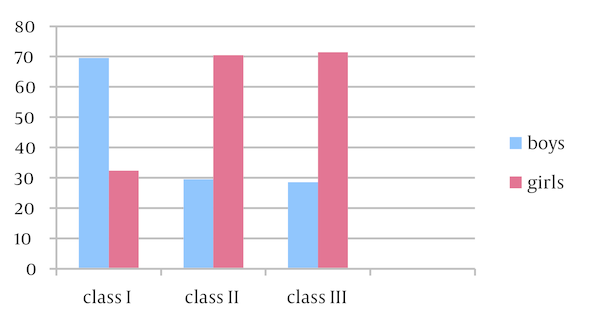 The prevalence of anterior open bite among gender and age in this study was not significant and is similar to other studies (19-21) where no differences in gender were observed but the relationship between sagital malocclusion and gender was significant (P < 0.002) as the class II and class III malocclusion were higher in females. Overall, anterior open bite was found in 2.9% of the cases. In anterior open bite cases 3.6% were females and 2.1% were males. The prevalence of AOB in 11 years old children was 3.5% and in 12 years olds was 2.5%. 1.7% of children with class I, 3.2% with class II and 21.4% with class III malocclusion had anterior open bite. The problem of anterior open bite is multifactorial and regarding that vertical growth is the last dimension to be completed, therefor, it is important to evaluate the etiological factors responsible for it which improve the chance of treatment success. Authors’ Contributions: Saeide Talezade is the student who did the undergraduate thesis under supervision of Navid Hosseini and Soghra Yassaie and Zahra Moradi helped to prepare the manuscript. Funding/Support: The authors would like to appreciate Deputy of Research and Technology, Yazd University of Medical Sciences for funding the present study.